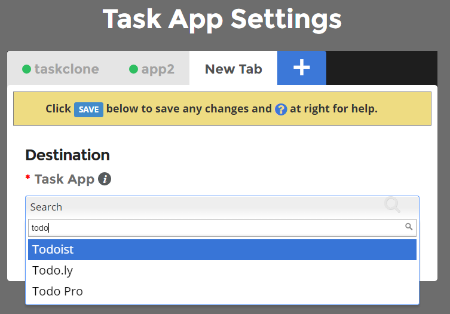 After initial setup you can add multiple destinations to TaskClone so you can send tasks to different projects or even different apps. Click the + symbol to begin set up of an additional destination. Select a destination. This process is virtually identical to the initial setup process you completed. Depending on the app you select, you will be prompted to take additional steps based on the requirements of that app. Enter Task Destination Email or follow other connection steps for your app This is where TaskClone will send tasks associated with your Trigger Tag. Add a Trigger Tag. Just type the name of any tag not already in use with TaskClone.